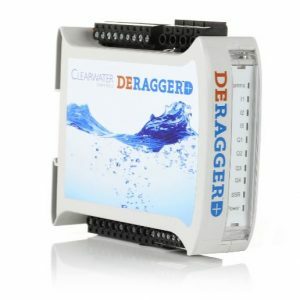 The DERAGGER+ constantly monitors the torque signature of a pump’s motor, and can dislodge and pass rags in Real Time should they become stuck on or inside the impeller/volute.This is achieved with a tuneable “clean cycle” involving a brief and unique series of forward and reverse motions of the impeller. By maintaining a clean impeller at all times, the DERAGGER+ ends the time-consuming and costly necessity of manually lifting pumps, thus eliminating downtime and other costs associated with pump ragging. The wealth of pump performance data includes individual phase voltage, current and power to Kw/Hrs, run time and a number of start counters. The device also logs daily average current and power consumption, plus average run cycle time. The DERAGGER can easily protect a pump from running dry should the float or level sensor fail.